Cases of hereditary ataxia (a family of five). Journal : Transactions of the Clinical Society of London, vol. 21. London : Longmans, Green and Co., 1888. Description : pp. 268-276, [1 l.] pl. ; ill.: 1 leaf photos., 5 text figs., 1 tbl. ; 22 cm. Photograph : one leaf with two images, (unverified). Photographer : W. Talbot Brett. Subject : Congenital disorders — Ataxia. Author caption: By JAMES F. GOODHART, M.D., and GEORGE CARPENTER, M.D. Exhibited November 25, 1887. Eponym: Carpenter's syndrome — acrocephalosyndactyly (described, 1901). 1. All the children have had convulsions. 2. That the youngest child has, as yet, only nystagmus, and the next to it, a boy of three years, is much less affected than are the three elder children. 3. That the baby, and perhaps the boy of three years, alone have a properly developed head. It appears, therefore, that as these children advance in age so they leave the development of their brains behind them ; and this is shown by the cyrtometer tracings of the several heads. — Page 268. Drs. Goodhart's and G. A. Carpenter's Cases of Hereditary Ataxia. Wallace, aged 6 1/2 years. From photographs by Mr. W. Talbot Brett. 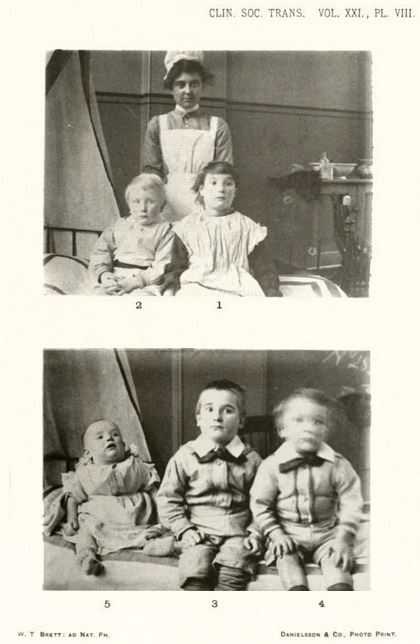 The two clinical photographs represent five affected siblings with a nurse attendant standing behind the two oldest children shown in the top photo. Text figures indicate the transverse profiles of the subjects' skulls. NLM lists only one other paper co-authored by Goodhart and Carpenter, titled, Tubercular peritonitis; its natural history, diagnosis, and treatment (1891).